On Tuesday, March 10th, Benjamin Zander, conductor of the Boston Philharmonic, presented to the Pacific Ridge community on "The Art of Possibility." 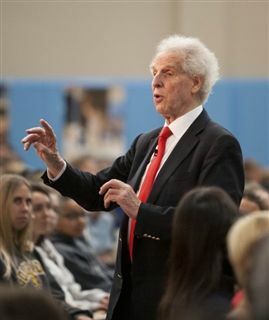 During his two performances - a morning presentation to the student body and evening presentation to parents and the public - Maestro Zander encouraged students, parents and community members to open their hearts and minds to the possibilities found in each moment and circumstance of life. Using music, personal anecdotes and his trademark enthusiasm (including an inspiring music lesson with junior Joon-Ha Bae on the cello), Zander engaged the imagination of attendees with his fresh perspectives on leadership, creativity, and communication.